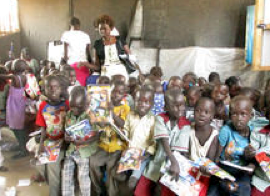 There is an elementary school for the children of refugees in Camp 1. The roof of the classrooms is built of galvanized iron sheets and the walls are made of bamboo material. There are 6 classes, one for preschool children and five for children up to the 5th grade. 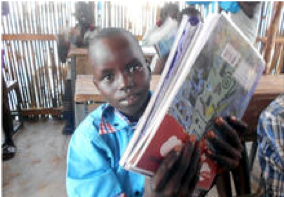 We have visited families inside the camp with the help of teachers in January and made a list of 300 children including those who hadn’t attended school. 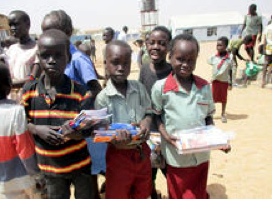 Then we distributed school goods such as notebooks, pencils, pens, and erasers in February. Distribution of school goods in February 2018. We visited the school again in March, one month after the distribution, and examined how many children attend the school and how many children use distributed school goods. According to the teacher, the total number of children is 361 as of March 2018. The number has actually increased from 300 to 361 from the time of the distribution. The teacher said, “Since tuition is free here, children who heard about it in Camp 2 also ended up attending here. 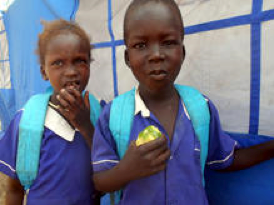 The school children are therefore increasing.” I asked a question in the preschool class, “Did you receive the notebooks we distributed in February?” No answers. The question might have been difficult for them to understand. Children in the 2nd grade class show us the notebooks that they have received. The 1st grade class was alike, but everyone in the 2nd grade class could understand our question and took out and showed us the distributed notebooks. 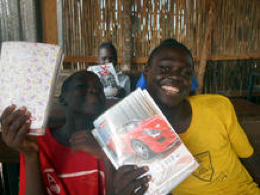 As we counted, 35 among 40 children in the classroom were holding notebooks we distributed. In the 4th grade class. In the 5th grade class. By the way, what we were concerned about when we went around classrooms is that the number of registered children and the number of children who actually come to the school are significantly different. As mentioned before, the number of registered children is 361. On that day the total number of children in the classrooms were about 230. That means that more than 100 children were absent. We asked the students, “Where are the children who are absent? What do they do?” The students answered, “They went to the UN camp”. 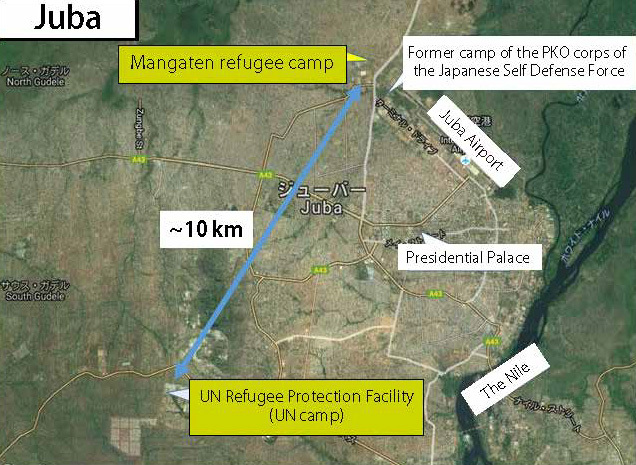 The “UN camp” which they were referring to is the UN Refugee Protection Facility. 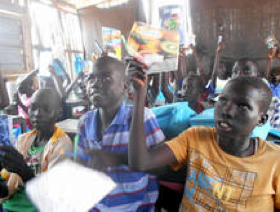 It’s located in the area of the headquarters of the UN Peacekeeping Operations (PKO) in the suburb of Juba. The distance from here is about 10km. 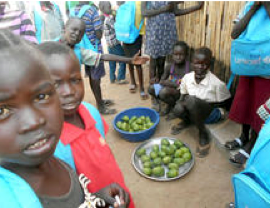 It seems that the children went to the UN camp in order to bring back food distributed there for their families in Mangaten. They bring back, for example, sorghum (a grain in the grass family), beans, flours, and food oils. We found out that couples are living separately in the UN camp and the Mangaten camp. We don’t know the reason clearly. It doesn’t mean that the relationship of the couples are not good, but it may be that there is an economic benefit they can get from support in both camps, or that the husband does not want to live in the UN camp for a political reason. Anyway, what we clearly understood is that the UN camp and the Mangaten Camp 1 are like two pools connected by an underground water path. If water (relief supply) flows into the UN camp, the water level of the Mangaten side rises as well. We discovered a new fact again by visiting the school. When children began running out at recess time, mango sellers came outside. The two sellers sitting in front of mangos piled up in a washtub were girls the same age of elementary school students. Elementary school students buy and eat them. One piece of mango costs 10 pounds, which sold very well to elementary school students. Everyone was eating it without peeling. The girls selling mangos go to market every day and buy two pieces of mango for 10 pounds. They then sell them at double the price. They don’t attend school at all. Although they are coming to the school to sell mangos every day, they are not registered in the school and never attended class. This incident made us think about the fact that such a situation is left unsolved right next to a classroom.